EVO announced today that it will provide full support for contactless payments made through leading mobile wallet providers Apple Pay, Android Pay, and Samsung Pay. Today’s announcement reflects our ongoing commitment to support global mobility and a growing number of alternative and non-cash payment methods. EVO Payments International (EVO), a leading card payment acquirer and payment service provider operating throughout North America and Europe, announced today that it will provide full support for contactless payments made through leading mobile wallet providers Apple Pay, Android Pay, and Samsung Pay. With the U.S. transitioning to EMV, business owners are now upgrading their payment hardware to offer support for chip-based cards – providing a unique opportunity to embed additional payment services within these devices. 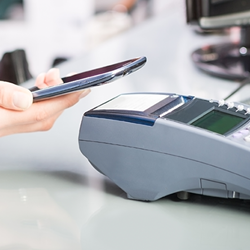 With enhanced support for contactless cards and mobile wallets using near field communication (NFC) technology going hand-in-hand with these upgrades, the stage is set for greater acceptance of mobile payments at the point-of-sale. In fact, according to its annual ‘Technology, Media & Telecommunications (TMT) Predictions’ report, Deloitte estimates that by the end of 2015, 32.5 million NFC equipped phones will be used at least once a month to make in-store mobile payments, up from under 2.5 million less than a year ago. Availability of the new mobile services has already rolled out in the U.S. with full support for Apple Pay, Android Pay, and Samsung Pay on EVO’s U.S. processing platforms. Additionally, EVO’s integrated payments platform, EVO Snap*, is providing support for mobile and contactless payments at the service layer for developers looking to expand in-app mobility offerings. Plans to expand service availability to EVO’s European platforms are already underway. EVO Payments International, LLC is a leading payments service provider of merchant acquiring and processing solutions for merchants, Independent Sales Organizations (ISOs), financial institutions, government organizations, and multinational corporations located throughout North America and Europe. A principal member of Visa and MasterCard, EVO offers an array of innovative, reliable, and secure payments solutions, backed by an uncompromising commitment to exceed the needs of its customers and partners. Visit http://www.EVOpayments.com for more information about the company and its services.